When Jennifer Birdsall applied to the Fulbright U.S. Student Program in Macedonia, her goal was to become a better teacher. Despite the success of the English club, Jennifer noticed a significant disparity between the library in the American corner and Macedonian corner. As word got out about the project, interest exploded. “Mansfried Shipping Company heard the kids wanted to donate these books,” says Jennifer. “They wanted to match the donations and take care of all the logistics of shipping. Runza Fast Food in Nebraska also donated, and when a local Lincoln couple passed away, they donated all of their money to the project. 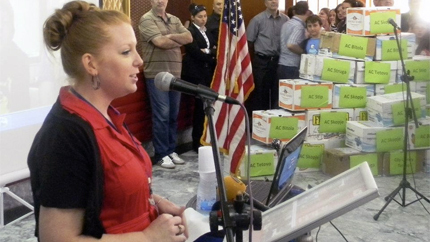 In total, about 14,500 books were shipped from Lincoln, Nebraska to Tetovo, Macedonia. Jennifer offered a few words of advice to other Fulbrighters.